The Kopli Lines (Kopli Liinid) are a tiny network of cobbled streets and wooden barrack-style houses situated at the end of Kopli Peninsula in Tallinn. The modern story of “the Lines” is a tale of neglect, crime and derision. Ask a local about the Kopli Lines and you will hear a response that is, at best, one of indifference. In recent decades this sub-district has developed a reputation as a gathering place for the social outcasts of Tallinn. News stories are awash with negativity and the area has taken on an almost mythical persona as a ‘place of no return’. Are the scorched remains of the Kopli Lines nothing more than a squalid collection of wood and brick, ready for demolition, or is this simply a matter of perspective? Yes, there is a justifiable reason to fear Kopli, but beneath the superficiality of the news headlines there is intrigue as well. This district has been frozen out of the success story of 21st-century Tallinn, but there is history here for those who know how to find it. The abandoned buildings, overgrown cobbled streets, peeling paint and eerie atmosphere all tell a story. Look with inquisitive eyes and the tales will be revealed. Believe it or not, only a century ago the whole Kopli Peninsula was a forest. No factories, no houses and no noise. Families would stroll along the peaceful coastal paths, breathe in the fresh sea air and maybe bring a picnic. How idyllic. World War I brought about the irreversible removal of this tranquility as the Russian government embarked on an ambitious shipbuilding project. The lush forests of Kopli Peninsula became the stage for two new industrial shipyards: Bekker and the Russo-Baltic Shipyard. The architects of this project envisioned far more than a churning mechanical complex at the tip of the Kopli Peninsula: they sought to build a functional working-class community, complete with all the essential institutions that the growing families would need. The Kopli Lines would form the central hub of this new working class community; provide housing, schooling, medical facilities, a shop and even a sauna for the factory workers and their families. Despite the fluctuating financial fortunes of the shipyards during the 1920s and 1930s, the Kopli Lines went from strength to strength. Simple, functional housing, a quaint coastal setting and solid employment from the shipyard, earmarked “the Lines” as one of the most valued and sought-after working-class communities in the city. Sadly, such periods of prosperity are rarely permanent and as funding began to decline, so did the fortunes of “the Lines”. After World War Two the government appears to have adopted a new policy towards the Kopli Lines: neglect. 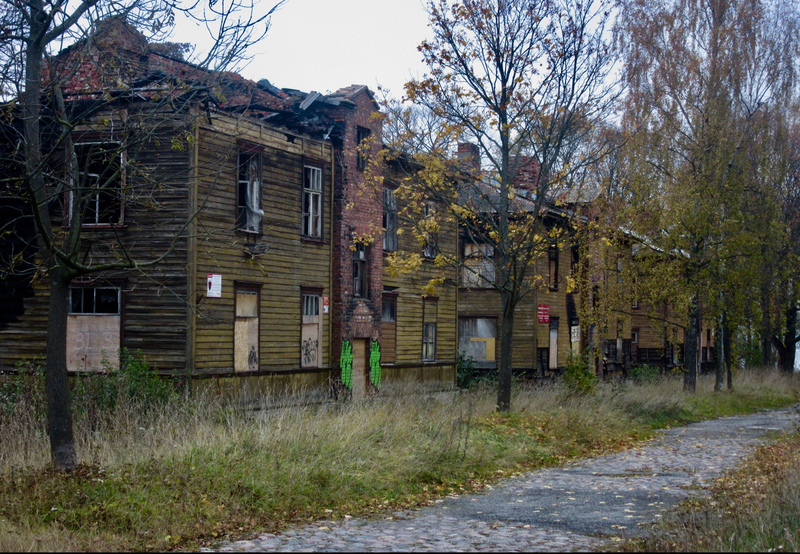 A series of fires and structural problems left many of the houses in need of serious attention, but the funding had gone elsewhere (probably towards more profitable house-building projects in the east of Tallinn). Combined with a sudden influx of migrants from other Soviet territories, the identity of the Kopli Lines changed. New residents struggled to adapt to life in this new district, many families left and social problems began to spiral. Over the following decades, the reputation of “the Lines” continued to decline as social outcasts sought refuge in the increasingly uninhabitable houses. Without the funding of the 1920s and 1930s, basic repairs were bypassed, derision and dereliction took hold and this tiny network of cobbled streets became a modern-day slum. Most abandoned structures in the former Soviet Union have fallen victim to some very abrupt social or economic shifts, transitioning from ‘functioning’ to ‘deserted’ practically overnight. The Kopli Lines, on the other hand, have declined in slow motion, like in a time-lapse film, each chip of wood, overlooked leak and slowly rusting door hinge incrementally adding to the increasingly severe state of decay. Today, this structural degeneration is perhaps the most visceral feature of “the Lines”. There are no longer any residents and very few (if any) squatters. Occasional stories of trouble flicker into the news but, generally speaking, the Kopli Lines are like a ghost town. No more than a shadow, shrouded in mystery – a dormant reminder of a prosperous past. For the adventurer, photographer, urban explorer or historian, the Kopli Lines are a beautifully preserved window into the past. More poignant than any museum, the abandoned structures dotted across the landscape provide a captivating ‘alternative history source’ for all those brave enough to walk their untrodden paths. Painted wooden panels, old, unhinged doors, and even curtains survive, proving that there is a tangible story behind this dereliction. The Lines were not always like this and on a quiet afternoon, wandering through this ghost town, the past lingers heavily in the air. Should you decide to visit, now is the time. The Kopli Lines will be at the heart of future developments in Tallinn… and the process has already begun. Plans are being drawn up, and demolition trucks stalk the landscape, picking off their targets one by one. This incarnation of the Kopli Lines will disappear, whether in one year or ten, leaving behind only memories. These hidden tales of the past will then exist only in the minds of those who seek them. This is part of the DB Under the Radar series, which highlights those alluring, unusual or intriguing places in Estonia, Latvia and Lithuania which rarely appear on tourists’ (or sometimes even locals’) itineraries. The first, dealing with the faded resort town of Ķemeri in Latvia, is here. Tom Tonks runs Hidden Tallinn, a blog dedicated to unearthing the secrets of Estonia and her fascinating capital city.